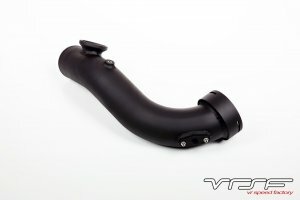 Increase throttle response and decreases turbo lag with the VRSF chargepipe for your 135i/335i/335is. Our aluminum chargepipe features a CNC billet aluminum OEM throttle body flange and is finished in powdercoated black. The VRSF chargepipe retains the OEM c-clip & utilizes a larger diameter o-ring in order to provide a better seal over the stock o-ring. We also offer the chargepipe with a Tial or HKS bov flange as well as a N55 setup. A plugged meth bung is included for those who are currently using meth or interested in using meth in the future. Our chargepipes include a plugged meth bung, caps to cover your intake recirculation ports and the couplers and clamps neccessary for installation.